DeZURIK’s HydraStorm Hydraulic Power Unit (HPU-DHS) generates a tremendous amount of power to drive most valves fitted with hydraulic cylinder actuators. The HPU-DHS is designed specifically with rugged construction and diverse capabilities to best suit the needs of tough indoor/outdoor industrial applications in numerous industries including mining, power, hydropower, water, wastewater, and others. 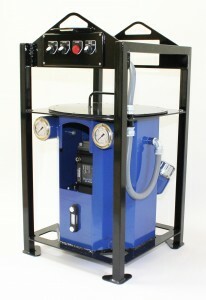 HPU-DHS Hydraulic Power Units are available in a variety of AC and DC voltages, three reservoir sizes, flow rates up to 24 gpm (90 l/min), pressures up to 3000 psi (20,684 kPa), and an operating temperature range from -49 to 140°F (-45 to 60°C). The HPU-DHS system is compact, portable, quiet and fully enclosed with IP66 protection (dust tight, water jet protected). Offered with intuitive operator controls and capable of operating a number of valve actuators, the HPU-DHS is both user friendly and easy to maintain. The CANBUS friendly interface allows integration with other common industrial communications, such as Profibus, DeviceNet, and other Ethernet based protocols.